The story of the Goderich Harbour begins in the 1820’s, when a trading post was established at the mouth of the Maitland River. The harbour lands, surrounding the mouth of the Maitland, were controlled by the Canada Company which commissioned two wooden piers to be built to protect ships from the wind and waves coming from Lake Huron. 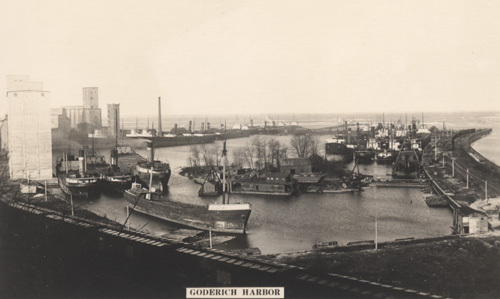 With the establishment of the piers, the Goderich Port became a centre of activity, with lumbering and agricultural products shipped out by steamer and schooner, and shipbuilding yards. In the decades that followed a number of businesses developed in the Harbour area, including: grain elevators, grist mills, warehouses, hotels and taverns. In 1859 the Canada Company sold the harbour lands to the Buffalo and Lake Huron Railway, which would later become the Grand Trunk Railway and eventually Canadian National Railway. After 10 years of ownership of the Goderich Port, the railway abandoned the Harbour after refusing to repair ice-damaged breakwaters. In 1872, the Port was able to secure funding to divert the Maitland River north and transform the 10 hectare estuary at the mouth of the river into a modern harbour. Between 1885 and 1911, Port improvements continued with the construction of the north and south breakwaters. Industry in the Port continued to flourish. The Goderich Port became a favourite wintering spot for schooners and other ships. Between 1840 and 1962, over 100 vessels were built in the habour. The first grain elevator at the Port was built in 1866 but was later destroyed by fire. The current elevators, constructed in the 1920s, are still in operation today. In 1866, Samuel Platt discovered salt while drilling for oil in the harbour. Following that discovery brining operations were developed. A mine was opened, but soon closed, as they were unable to keep the water from Lake Huron out of the mine. In 1959, the Sifto Salt Mine, which is still in operation today, was developed. 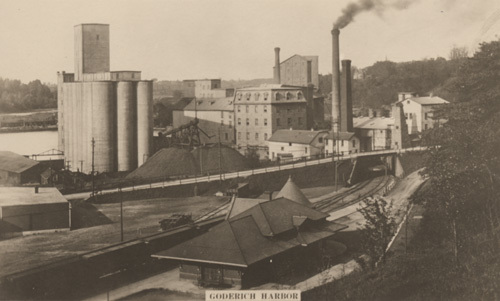 In 1999, the Town of Goderich purchased the Harbour from Public Works Canada (in conjunction with Transport Canada). Industrial users of the Port formed the Goderich Port Management Corporation (GPMC), a not-for-profit organization, responsible for the management of port facilities. Today, the Port continues to operate and to serve as an important commercial shipping port for Southwestern Ontario. Sallows, Reuben R. “Goderich Harbour.” Unknown. The Huron County Museum. [http://www.sallowsgallery.ca/gallerypages/picture.php?photo=5&s=Harbours&k=&r=&d=&sc=] [0026-rrs-ogoh-ph] (28 Oct 2011). Sallows, Reuben R. “Goderich Harbour.” Unknown. The Reuben R. Sallows Digital Library. [http://www.sallowsgallery.ca/gallerypages/picture.php?photo=11&s=Harbours&k=&r=&d=&sc=] [0035-rrs-ogoh-ph] (28 Oct 2011).